Quince can refer to both fruiting and ornamental plants. Edible quinces (Cydonia oblonga) produce fruit akin to apples and pears while ornamental quinces (Chaenomeles) are grown for their spring flower displays. Quince trees are deciduous and grow from 10 to 20 feet tall with a rounded shape and gnarled branching pattern. 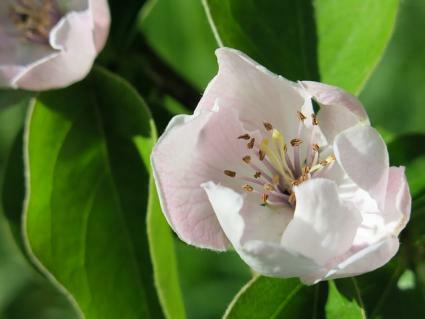 With their pinkish white blossoms in early spring, they have a similar appearance to apples trees, though the leaves of quince are larger, growing up to four inches in length. It's hardy in USDA zones 5 to 9. Quinces are available as bare root trees in late winter and early spring, which is the best method (and season) to plant them. They need full sun, good drainage and average garden soil. The primary maintenance for quince trees is annual pruning in late winter before they come out of dormancy, which is important for maintaining a small size (to allow for easy harvesting) and to promote maximum fruiting. Use the same methods for pruning apple and pear trees when pruning quince. Quince is highly susceptible to fire blight, a disease that causes die-back at the tips of the branches; there is no cure, but mild cases can be managed by removing the diseased wood as soon as it appears. They are also susceptible to codling moth, an insect that can be controlled with insecticide or special, pheromone-based traps. Quince fruit is usually tart and astringent when eaten raw, but is used in preserves and for baking. Wait until it has developed a full yellow color before harvesting. When cooked, quince has a flavor and texture similar to spiced baked apples. 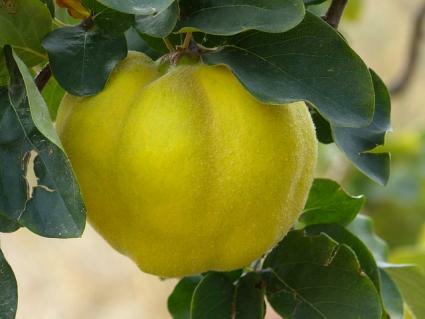 Quince varieties are not widely available in garden nurseries, so it is often necessary to order them online. 'Pineapple' has extra large fruit and is a prolific producer. 'Portugal' is known for turning an attractive red color when cooked. 'Karp's Sweet' is not as astringent as other varieties and can be consumed raw. Flowering quinces are tough and adaptable shrubs grown primarily for their profusion of pink, red or white flowers that appear on bare branches just as the leaves start to emerge in early spring. The six to 10 foot deciduous shrubs also produce fruit which is enjoyed by wildlife, but is unpalatable to humans. 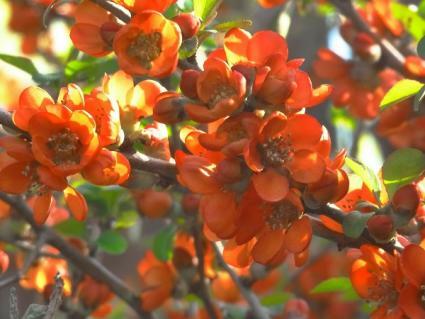 Flowering quince has formidable thorns and is often used to make an impenetrable hedge. 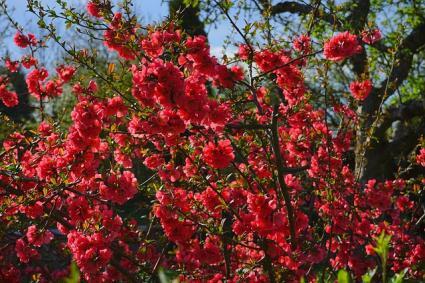 Flowering quince tolerates partial shade, but flowers more prolifically in full sun. It is tolerant of a wide range of soils and is virtually never troubled by pests and disease. Plant flowering quince in spring or fall for best results. Mixing a bit of compost into the planting hole is helpful if the existing soil in the planting area is poor. Keep young plants mulched to encourage good root growth and fast establishment. Quince naturally takes on an attractive rounded shape though it can be maintained as a sheared hedge if desired. If growing it as an informal hedge, it's still a good idea to cut it back about 25 percent each winter to promote the most prolific flower display. Flowering quince is commonly available in nurseries and is hardy in USDA zones 4 to 9. Look for some of the following varieties. 'Cameo' has light pink double flowers. 'Texas Scarlet' has bold red flowers. 'Jet Trail' is a dwarf variety, growing just three to four feet tall and wide, with white flowers. 'Nivalis' has white flowers and an upright growth habit. Quince fruit is a special treat that is difficult to find in a grocery store but easy to grow in the backyard. Even the flowering varieties offer something to harvest, however -- the cut branches hold their blossoms for a long period indoors and are often used in flower arrangements.